An elision is a type of contraction that occurs when two words are combined: one or more letters are dropped and replaced with an apostrophe. In English, elisions like "I’m" and "can’t" are optional and indicate informality. In French, however, written elisions are required, regardless of the register you’re speaking or writing in. 1) Definite articles: le and la elide with nouns that begin with a vowel or h muet. 2) Direct object pronouns: le and la contract with verbs that begin with a vowel, h muet, or adverbial pronoun y. Exception: No written elision when je is inverted. Je and tu have additional elisions in informal French. before onze Je pense que onze euros seront suffisants. 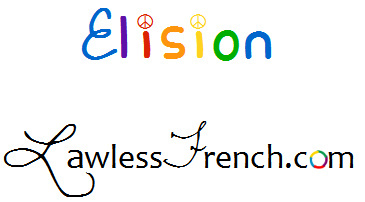 Elision also refers to the dropping of the e sound (e instable), which Le Bon Usage calls « l’élision comme phénomène phonétique ». Two words that combine into one with a different spelling result in a contraction.